This is the sixth in a 12-part monthly series profiling scientists and technicians who provide exemplary contributions to the mission of NOAA’s Office of Response and Restoration (OR&R). This month’s profile is on Assessment and Restoration Division Northwest and Great Lakes Branch Chief Amy Merten. Amy Merten with her husband, Joel, and her Weimaraner, Greta. (Image courtesy of Amy Merten). Many people are familiar with NOAA’s Environmental Response Management Application (ERMA®) — an online mapping tool that integrates both static and real-time data — but not everyone knows where the idea for ERMA came from. OR&R scientist Dr. Amy Merten’s idea for such a mapping tool was born from her frustration at the lack of a centralized, interactive mapping platform for information at spills she had responded to in the past, particularly following the spills resulting from the 2005 Hurricanes. The project to develop this tool became a collaborative effort among the OR&R team, Dr. Nancy Kinner’s team from the University of New Hampshire’s Coastal Response Research Center, the U.S. Environmental Protection Agency (EPA), the Coast Guard, and the Department of the Interior. The application was put to the test in 2010, when it was used as the common operating picture at the Deepwater Horizon oil spill in the Gulf of Mexico. After earning her bachelor’s degree in biology from the University of Colorado Boulder, Amy went on to pursue her master’s and doctorate both from the University of Maryland Chesapeake Biological Lab, where she focused on fate and effects of organic contaminants on benthos organisms in the food web. 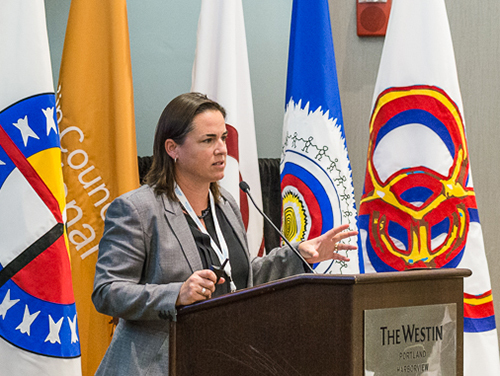 Having developed an early interest in Arctic issues during her undergrad research, her experience with the Selendang Ayo, and from oil in ice research priorities through Coastal Response Research Center (CRRC), Amy served as Chair of the Arctic Council’s Emergency Prevention, Preparedness, and Response Working Group (EPPR) from 2015 to 2017. The Arctic Council is the leading intergovernmental body promoting cooperation, coordination and interaction among the eight Arctic countries, Arctic indigenous communities, and other Arctic inhabitants on common Arctic issues. The specific focus of the EPPR is to protect the Arctic environment from the threat or impact of an accidental release of pollutants or radionuclides. Amy successfully chaired the EPPR for the two years that the U.S. held the Arctic Council Chairmanship. She moved from the D.C. area to Seattle in 2003 to work as a response biologist in OR&R. Since that time, while still in Seattle at OR&R, she has served as co-director of the CRRC (partnered with the University of New Hampshire) on oil spill and Arctic issues and while chief of OR&R’s Spatial Data Branch, led the Natural Resources Damage Assessment (NRDA) data management effort in the years following the Deepwater Horizon oil spill. Most recently, Amy accepted the position of the OR&R Assessment and Restoration Division’s Northwest and Great Lakes Branch Chief. Some of major sites this branch is focused on include Hanford Nuclear reservation and the Duwamish River industrial site in Washington State, Portland Harbor in Oregon, and the Kalamazoo River in Michigan. Since Alaska is part of the Northwest region, Amy looks forward to representing OR&R on Arctic injury assessment, such as identifying effects of coastal pollution from oil spills and other sources. Some of the challenges Amy faces are ensuring adequate time is spent building partnerships as well as striving to stay ahead of ever-changing requirements and technology. Throughout her career, she has found “working with talented, bright people focused on same mission,” the most satisfying aspect of her job. Amy is a budding ukulele player and loves participating in triathlons and skiing. She lives in Seattle with her husband, Joel, and her Weimaraner, Greta. This blog post was written by Vicki Loe, Office of Response and Restoration Communications Coordinator. 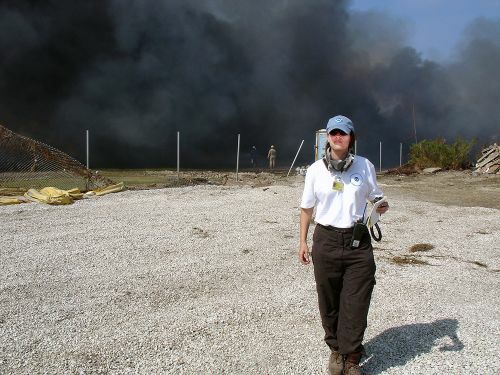 Amy Merten at a marsh near the Chevron Pipe Line Company's Oil Terminal in Buras, Louisiana, one of the largest crude oil distribution centers in the world. Oil had spilled into the marsh from a storage tank that had been damaged during Hurricanes Katrina and Rita in 2005. The following month, Amy was part of the team that decided the best way to treat the marsh was to burn the oil off in a procedure known as in situ burn. Image credit: NOAA. Dr. Amy Merten speaking at the Arctic Council Senior Arctic Officials Meeting as her role as Chair of the EPPR Working Group in October 2016. Image credit: NOAA.